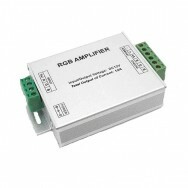 The RGB Amplifier can be used to support RGB Strip Light installations that exceed the maximum load of your power supply. The amplifier plugs in between your strip lights using normal terminal block connections. Note: The RGB Amplifier requires its own power supply, which is sold seperately. If you are unsure about anything please call us on 0116 321 4121 or email support@ledstriplights.co.uk.